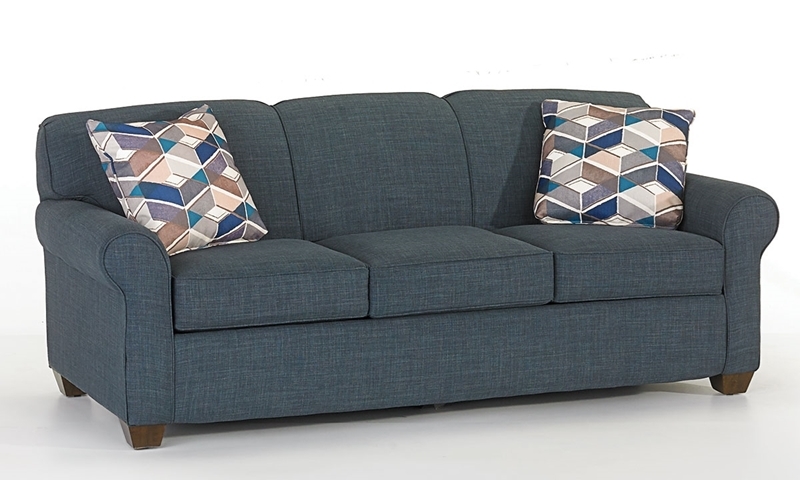 Sofa by day, sleeper by night--- The Mayhew from Klaussner is a living room must-have. Its hardwood frame creates a sturdy silhouette with welted roll arms, tight back and box cushions for a versatile, polished look. Two patterned toss pillows supply extra style, but the whole design can be custom ordered in hundreds of different fabrics to suite your décor. A recessed handle makes it easy to pull out this sofa’s queen size mattress atop a metal mechanism with cross wires for additional comfort and support. Matching loveseat and chair also available. See store for details.